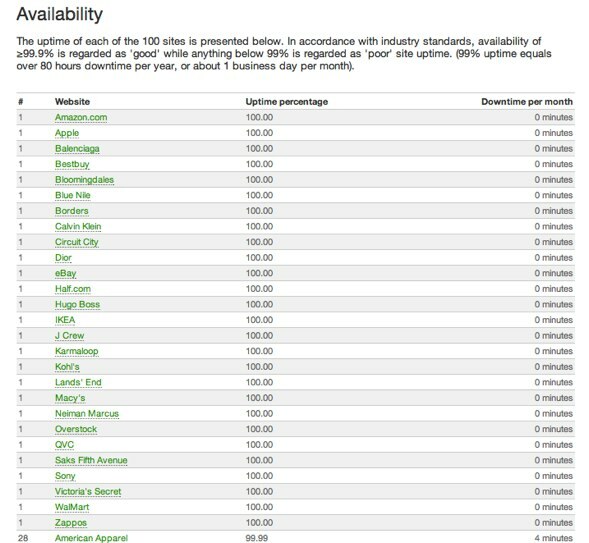 Website monitoring startup WatchMouse is now monitoring the top 100 retail websites for availability around the holiday shopping season. The starup tested retail sites including Apple, Amazon, BestBuy, Borders, Overstock, Walmart and Zappos, for availability and performance during the month leading up to and including Thanksgiving Day, November 25 and Black Friday, November 26. WatchMouse says that 27 of the 100 sites had 100% uptime; 15 came in at 99.99%, and only American Eagle Outfitters, GiltGroupe, Footlocker.com, and Fry’s Electronics landed in the “unacceptable” category. American Eagle Outfitters performed the worst during the monitoring period from October 25 – November 26, 2010 with nearly one full day of downtime. Additional websites that experienced performance issues on either Thanksgiving, Black Friday, or both included Abercrombie and Fitch, Bulgari, JC Penney, Louis Vuitton, Office Max, Pottery Barn, Toys R Us, Williams-Sonoma, and Z Gallerie. WatchMouse says e-retailers are particularly vulnerable to slow page load speeds because of the large number of components each website needs to load in order to optimize all of its product offerings and images. But latency and performance is particularly important for retail sites because users will abandon transactions. According to a recent report published by Forrester Research and Akamai, two seconds is the new threshold in terms of an average online shopper’s expectation for a web page to load. Other research conducted by Google and Microsoft revealed that a delay of only a half second can cause increased shopping cart abandonment rates, higher bounce rates, fewer pages per visit, and reduced revenue per site visitor. With consumers expected to spend $32.4 billion online this season, retailers are under even more pressure to ensure that their sites perform over the next few months. While more retailers were offering online deals this year on Black Friday, it should be interesting to see how retail sites perform on Cyber Monday, which is one of the most trafficked online spending days of the year. You can access WatchMouse’s full list here.